Intertwining ribbons of 14K white gold are interrupted by delicate blooms on the surface of this vintage wedding band. 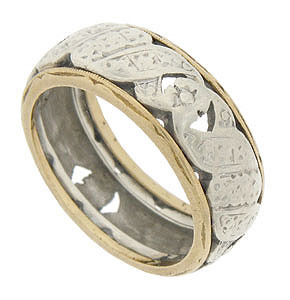 Detailed engraving decorates the surface of the design. Yellow gold bands edged in delicate milgrain frame the central band. 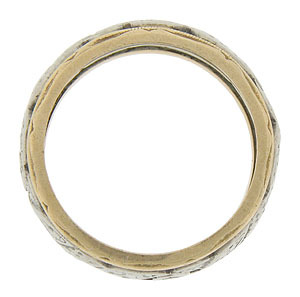 The estate wedding ring measures 7.12 mm in width. Circa: 1940. Size 5 1/2.